Traumatic Brain Injury [TBI}, also known as Head Injury and Acquired Brain Injury [ABI], is defined as injury to the brain which occurred as a result of trauma, and is non-progressive. It occurs when an external force impacts the brain, & often is caused by a blow, bump, jolt or penetrating wound to the head. However, not all blows or jolts to the head cause TBI: some just cause bony damage to the skull but do not cause brain injury. Mild TBI is also known as Concussion. Road Traffic Accident [RTA] This includes vehicle collisions, pedestrians being hit by a vehicle, vehicle-cyclist and car-motorcyclist collisions as well as bicycle and motorbike crashes which do not involve another vehicle. Until recently, RTA was the primary cause of brain injury, but an international study published in 2013 reported that "falls have now surpassed road traffic incidents as the leading cause of this injury". One study found that TBI was "a major cause of death and disability on the United States, contributing to about 30% of all injury deaths". A 2010 study looked at data from several nations, and reported that:"each year 235 000 Americans are hospitalised for non-fatal TBI, 1.1 million are treated in emergency departments, and 50 000 die. The northern Finland birth cohort found that 3.8% of the population had experienced at least 1 hospitalisation due to TBI by 35 years of age. The Christchurch New Zealand birth cohort found that by 25 years of age 31.6% of the population had experienced at least 1 TBI, requiring medical attention (hospitalisation, emergency department, or physician office). An estimated 43.3% of Americans have residual disability 1 year after injury. The most recent estimate of the prevalence of US civilian residents living with disability following hospitalisation with TBI is 3.2 million." Often occurs as a result of RTA, or a blow to the head, or a fall where the head strikes the floor or another hard surface.. In closed head injury, the skull is not penetrated, but it is frequently fractured. Generally there is both focal and diffuse axonal damage. This is caused by a penetrating wound, eg. by a weapon or from a bullet. In these cases the skull is penetrated. The brain injury is usually largely focal axonal damage. This frequently occurs in RTA, when rapid deceleration occurs as the skull meets a stationary object, causing the brain to move inside the skull. Mechanical brain injury occurs due to axonal shearing, contusion and brain oedema. This occurs when the impact is sufficient to cause the brain to move within the skull; the brain moves in the opposite direction, and hits the opposite side of the skull, causing bruising. This is a frequent occurrence - opposite poles of the brain suffer injury. AKA Primary Damage and Primary Insult. Primary mechanical brain injury is the direct injury to the brain cells caused by the initial impact. The mechanical forces can cause intracranial haematoma [ defined as "a localised swelling that is filled with blood caused by a brea in the wall of a blood vessel"] and/or vascular injury, as well as injury to cranial nerves. 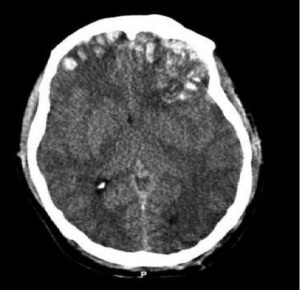 In the CT scan image shown here, skull fractures are visible, as well as multiple frontal, parietal and emporal lobe contusions with a subdural haematoma on the left side as well as associated interhemispheric haemorrhages. AKA Secondary Damage. Non-mechanical brain injury is caused by ischaemic, cytotoxic and inflammatory processes. One of the most significant factors is the excessive release of glutamate and aspartate, which alter cell wall permeability which ultimately leads to destruction of axons. The presentation depends on the areas of the brain which have been damaged. Spasticity if one of the early signs of TBI. This often develops a week after the injury. Symptoms include hypertonicity and spasm of the affected muscles and an increase in deep tendon reflexes; it's severity can range from mild stiffness of the muscles to severe (and painful) muscle spasms. 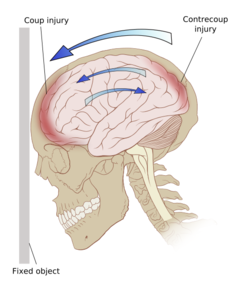 Physical mechanism causing the injury, categorised as contact or "impact" loading when the head is struck or strikes an object, as oppsed to non-contact or "inertial" loading (which is when the brain moves within the skull. Loss of consciousness: In Moderate brain injury, loss of consciousness [LOC] ranges from 30 minues to 6 hours, and generally the patient will have a GCS score between 9 and 12. In Severe brain injury, loss of consciousness occurs for more than 6 hours and the GCS score is 8 or lower. Post acute TBI, all patients are encouraged to undergo an urgent neurological examination in addition to a surgical examination. Magnetic Resonance Imaging (MRI) and Computerised Tomography (CT) scanning are frequently used in order to image the brain. CT scanning is indicated in the very early stages post injury. The EFNS guidelines confirmed that the use of CT scans can be limited to patients with Mild TBI that present with certain clinical signs and symptoms. The CT scan can show potential fractures and can detail haemorrhages and haematomas in the brain, as well as contusions and swelling. MRI is often used once the patient is medically stable to give a more detailed view of the brain tissue. Anti-epileptic medication is often provided in the early stages to avoid any additional brain damage which might be caused if a seizure were to occur. BrainLine is an American multimedia website providing information and resources about treating and living with TBI; it includes a series of webcasts, written online resources and an electronic newsletter. It has a version in Spanish too. ↑ 6.0 6.1 Vos PE, Alekseenko Y, Battistin L, Ehler E, Gerstenbrand F, Muresanu DF, Potapov A, Stepan CA, Traubner P, Vecsei L, Von Wild K. Mild traumatic brain injury. European Journal of Neurology. 2012 19 (2): 191-198.